Genuine aquamarine heart ring set with accent diamonds and crafted in fine 14k white gold. Aquamarine gemstone measures 4mm x 2.8mm in size and weighs 0.22 carats. Diamond total carat weight: 0.01 carats. Heart ring face/top measures approx. 3/8" in size. Band measures approx. 1.3mm in width. See our collection quality aquamarine rings. 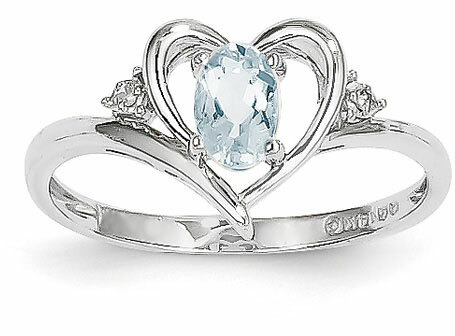 We guarantee our Aquamarine Heart Ring, 14K White Gold to be high quality, authentic jewelry, as described above.